I’m far from an expert on video editing, but I gave it my best shot. Click The 2017 Baltimore Summer Antiques Fair to view my video on YouTube. Hope you enjoy it. The video took hours to prepare, so I will leave this post for the entire week. There will be no new post this coming Monday. 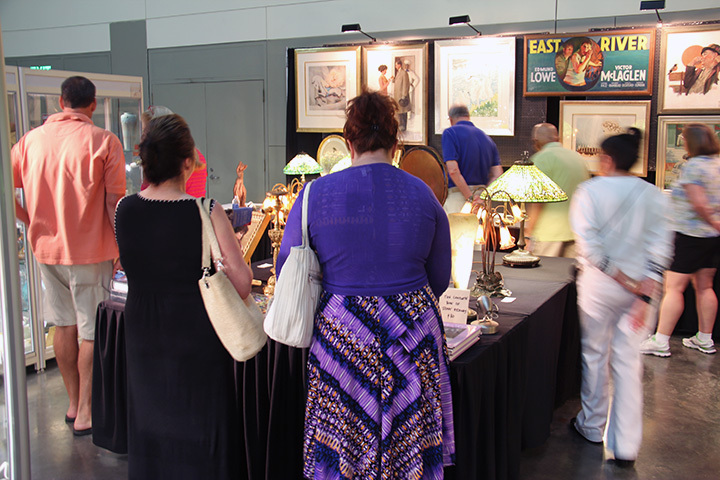 The Baltimore Summer Antiques Show finished its four day run yesterday, August 27, 2017. The show was smaller this year, but the attendance was good. Hopefully the show won’t continue to shrink as that could cause it to fail. I’ve got my fingers crossed that that won’t happen. Personally our show went well. We ground out business by making several small sales every day. 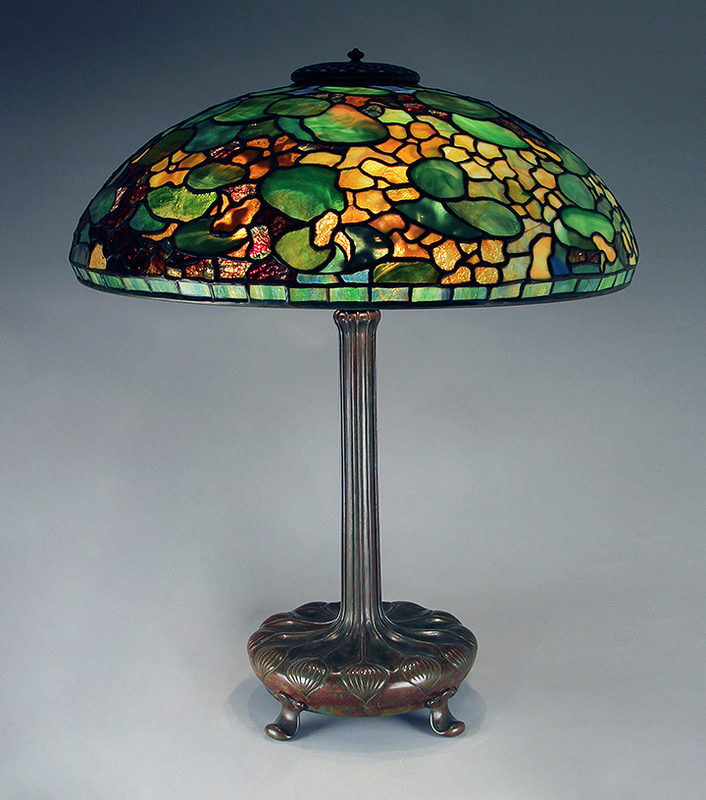 Then Sunday we had a good day, including the sale of a major Tiffany lamp. All that added up to a better show than last year. We sold across the board, including bronzes, paintings, art pottery, French cameo glass, Tiffany desk sets, American glass and lamps. In asking around, most dealers were pleased with their results. A few complained, especially West Coast dealers who had higher expenses because of the distance. I’ll be preparing a video blog of the show including interviews with quite a few dealers. It will be available for viewing with my Thursday blog this week, so make sure you don’t miss it. Next year the show moves back to the Labor Day weekend. All I heard was complaining from the dealers. No one wants the show to return to that weekend, but the management, as usual, thinks they know better, so they won’t listen. Maybe they’ll listen if many of the dealers don’t return signed contracts. We’ve already signed ours, so we’ll do the show no matter the weekend, but we’re not happy about it. Time passes quickly. 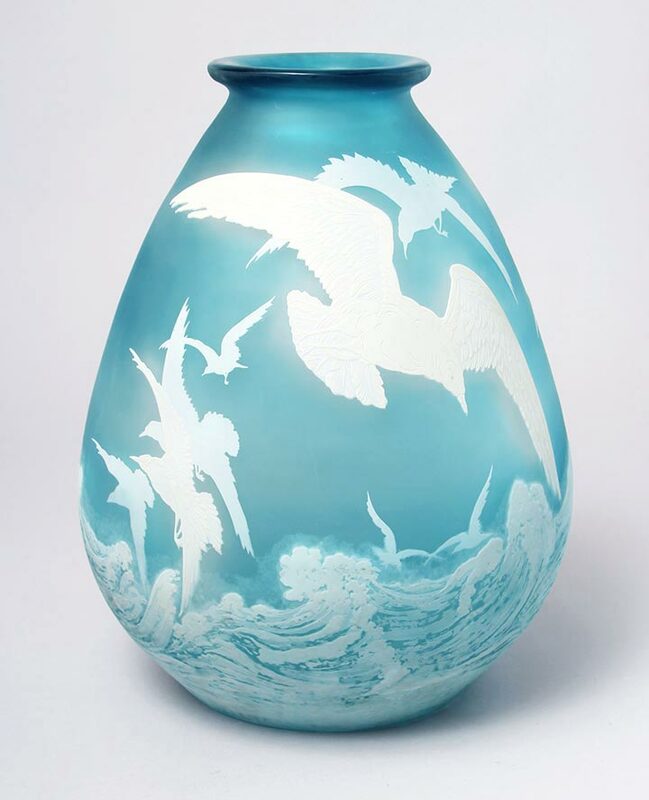 The much anticipated Baltimore Summer Antiques Show is arriving this week! It opens to the public this Thursday, August 24th at noon and continues until Sunday, August 27th at 6 PM. Tens of thousands of guests travel to visit one of the best shows of the year, some from great distances. Both exhibitors and attendees come from all over the world, including Europe, South America and Japan. So wherever you are, you don’t have a good excuse. Baltimore has great restaurants, the Inner Harbor, street performers, stores, the National Aquarium and of course the best antique show money can buy. It’s not too late to make plans. Hotwire.com has a 4-star hotel for $85 a night that’s hard to beat. It’s located a short walk from the Baltimore Convention Center where the show is being held. If you haven’t yet visited, you should. 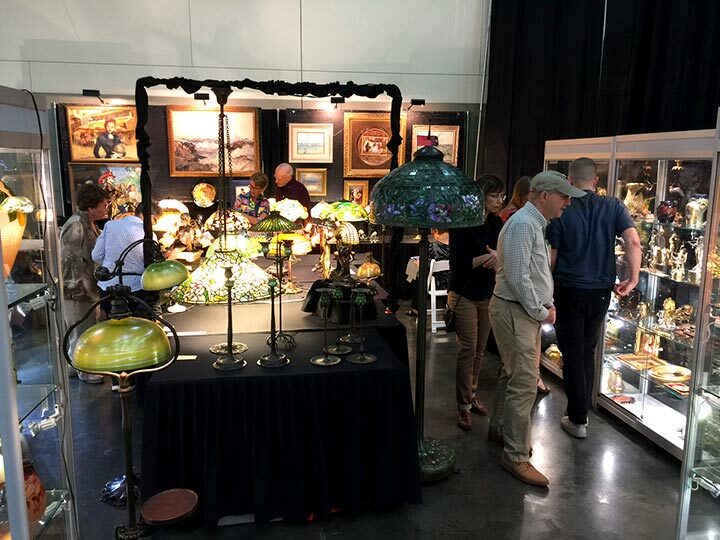 It’s big, with some of the best national and international dealers, all under one roof. You’ll also enjoy Baltimore. Hope to see you there! 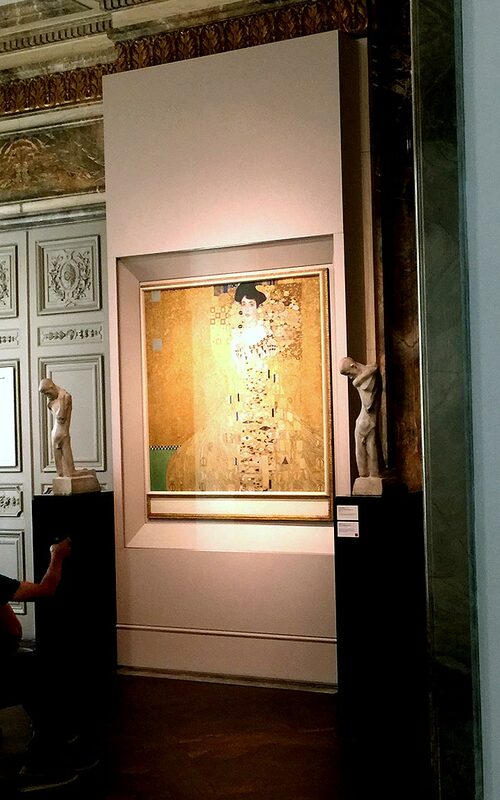 If you’ve seen the movie Woman in Gold, you know the fascinating story behind the Neue Galerie’s acquisition of Gustav Klimt’s Portrait of Adele Bloch-Bauer. It used to be on exhibition at the Upper Belvedere Museum in Vienna, Austria. 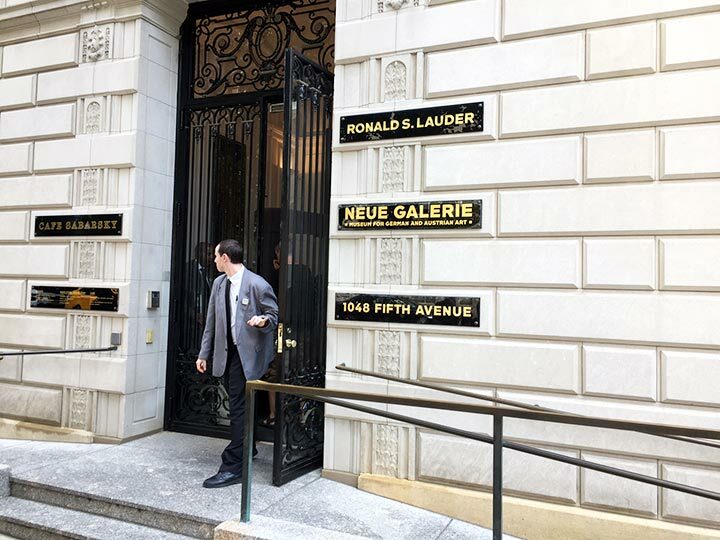 So after a visit there in 2013, I added a visit to the Neue Galerie in New York City to my bucket list. It took a while for our visit, but it was worth the wait. The museum is conveniently located in NYC’s Museum Mile, a stone’s throw from the Metropolitan Museum of Art. It’s fairly small, but with a very high quality collection of German and Austrian art, including works by Gustav Klimt, Oskar Kokoschka, Alfred Kubin, and Egon Schiele. 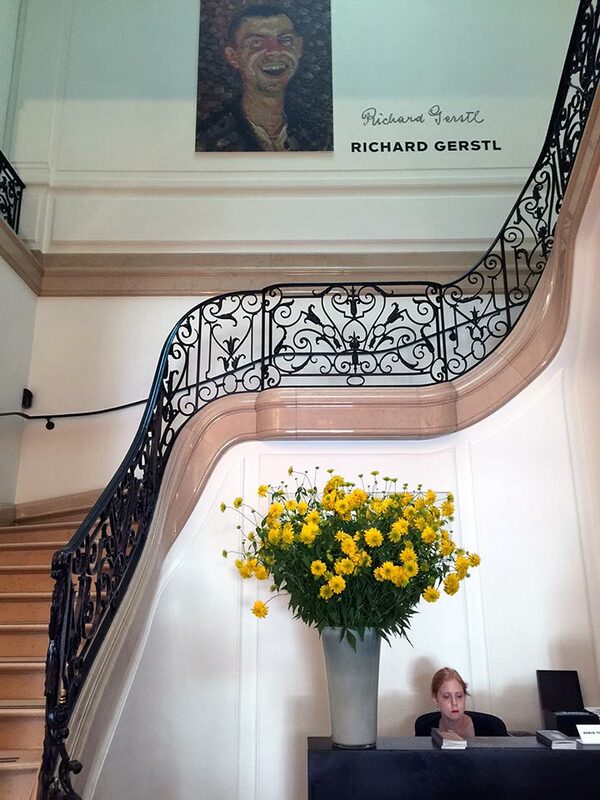 The Klimt display includes several wonderful portraits of Vienna’s society women, including two of Adele Bloch-Bauer (1907 and 1912), and paintings of Gertha Loew (1902), Elisabeth Lederer (1914-15), and Ria Munk (1917). Of course, Portrait of Adele Bloch-Bauer is the stunning highlight. This great collection of masterworks is only on display until September 25, 2017, as several of them are on temporary loan. 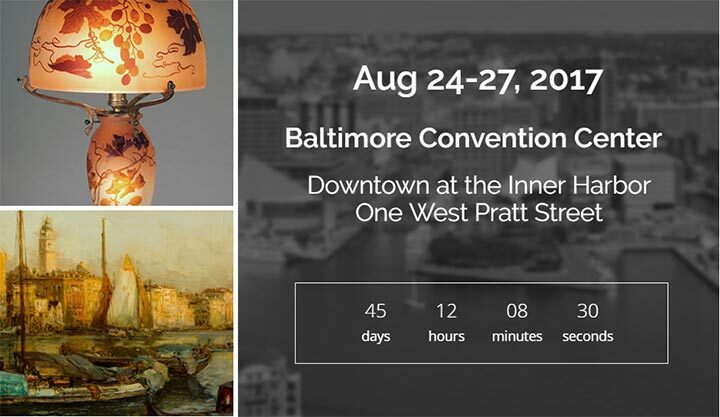 Time passes quickly and the eagerly anticipated Baltimore Summer Antiques Show is less than two weeks away, August 24-27, 2017. It’s not too late to make plans. Hotwire.com has a 4-star hotel for $85 a night that’s hard to beat. The Baltimore Show is the best show of the summer and possibly the best of the year. People fly in from all over the world to attend, including Europe and Japan. If you haven’t yet visited, you should. It’s big, with some of the best national and international dealers. You’ll also enjoy Baltimore. Hope to see you there! Click Philip Chasen Antiques to check my website for the latest items and to look around. I recently added several new items and I’ll be adding more this week. They’re some of the best items I’ve ever had, so I suggest you click on the following link and take a look. Philip Chasen’s new items. 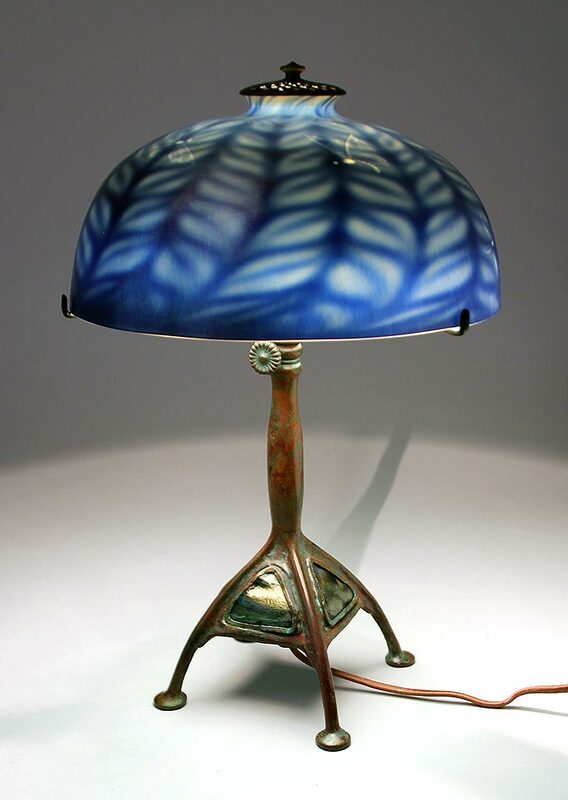 I just sold one of the best Tiffany Favrile lamps in existence. But don’t feel bad if you missed it, as I never advertised it publicly. I sold it privately to one of my best clients. You never had a chance. 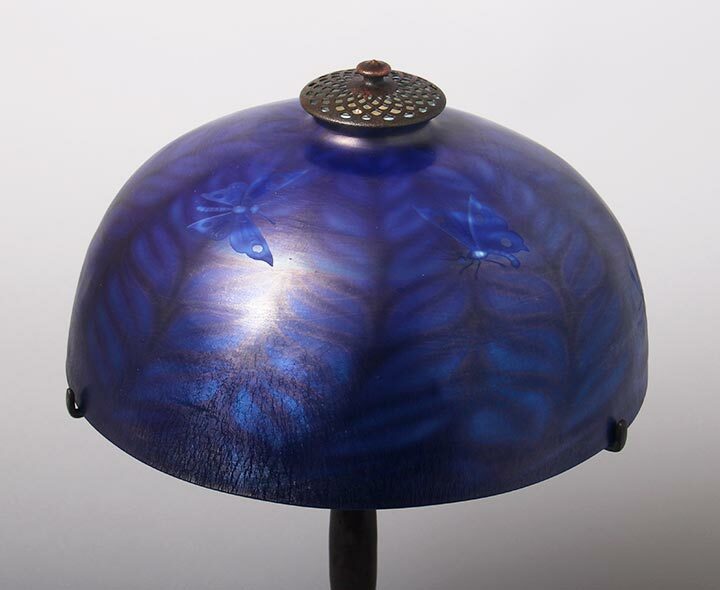 The 10″ diameter Favrile shade was a magnificent intense blue-purple with an internal honeycomb decoration that showed well when lit. Four gorgeous insects were meticulously intaglio-carved into the shade. It’s one of the two or three best Favrile shades I’ve ever seen, bar none. The base was a very rare telescopic example with inset green iridescent Turtleback tiles and a #10 patina. 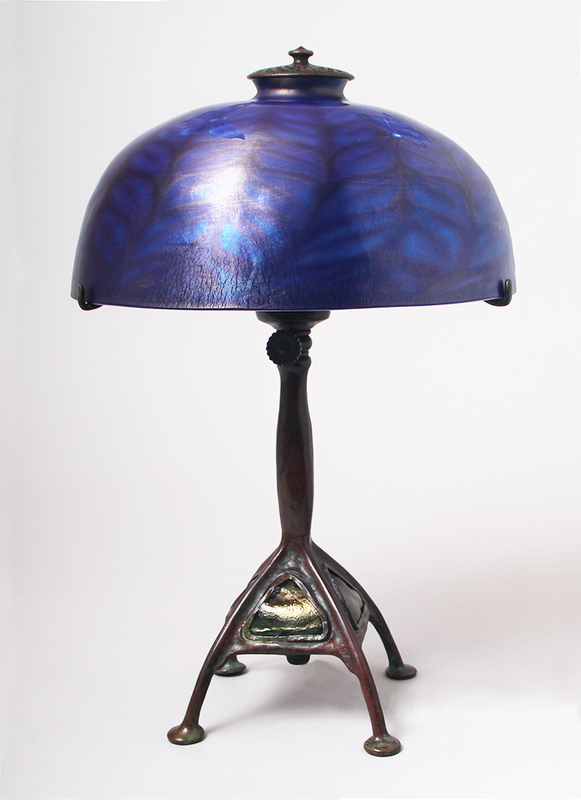 The lamp was in pristine condition and fully signed on the shade and base. In my opinion, it was worth $60,000 – $65,000, but I didn’t sell it in that range. 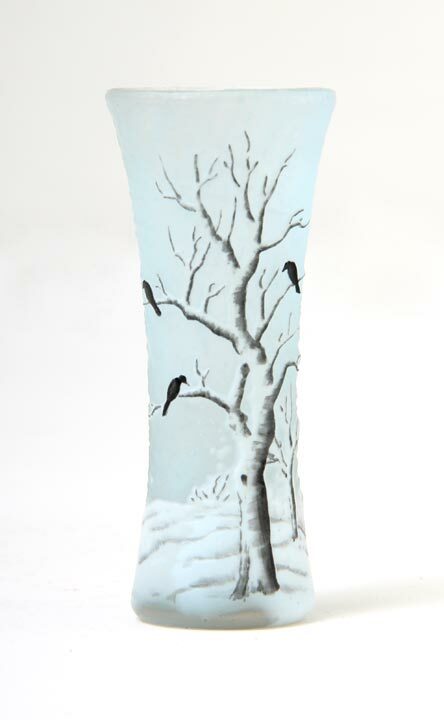 I would have asked it if I had exhibited it at a show or listed it on my website. The actual selling price will remain confidential. Have anything similar you want to sell or trade? Let me now. Our next show, the eagerly anticipated Baltimore Summer Antiques Show, is almost upon us, August 24-27, 2017. It’s the best show of the summer and possibly the best of the year. People fly in from all over the world to attend, including Europe and Japan. If you haven’t yet visited, you should. It’s big, with some of the best national and international dealers. You’ll also enjoy Baltimore. Hope to see you there!